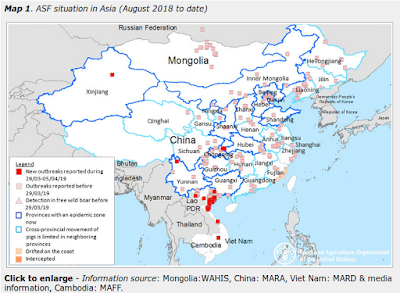 While the emergence and spread of African Swine Fever over the past 6 months in China, Mongolia, and most recently Vietnam have make the most headlines, this devastating pig disease has been spreading in Eastern Europe and Western Russia for roughly a dozen years. Last September, however, the virus was found in wild boar in Belgium - signifying a westward jump of more than 500 km (see OIE Notification: African Swine Fever Jumps To Belgium) - raising the stakes for all of western Europe. This week the UK's DEFRA (Department for Environment, Food and Rural Affairs) released their 20th assessment on the spread of the virus in Eastern (and now, Central) Europe. The (limited) good news is the number of ASF outbreaks reported over the past 6 months has declined over what we were seeing a year ago, although how long that lasts is anyone's guess. Since our last report on the 8 th January 2019, there have been new outbreaks of ASF in domestic pigs and cases in wild boar in Eastern Europe. The numbers of outbreaks in domestic pigs (backyard and commercial) since July 2018 are summarised in Table 1 for each country. Over the past 6 months (to date), there has continued to be a decrease in reports in domestic pigs, with reports in January to March, to date, restricted to Romania (61), Ukraine (7) and Poland (1). Although the largest number of outbreaks in domestic pigs each month is for Romania, these were mainly backyard pig small-holdings. In contrast, the number of cases in wild boar has remained high in January and February (Table 2). Although wild boar cases have been increasing from October 2018 in Eastern Europe, there have been no new large geographical jumps so far in 2019, and increased numbers of ASF-positive wild boar may be related to increased wild boar culling and surveillance activities. The last significant jump of ASF within Europe was the emergence of ASF in Belgium in September 2018. Eastern Europe is continuing to report outbreaks of ASF in domestic pigs, although this appears to be restricted to the south-east region; namely Ukraine, and Romania, with a single outbreak reported in Poland, and with other countries reporting no outbreaks in January to March, to date. The picture in wild boar is concerning and shows ASF is increasing since October 2018 in wild boar particularly in Poland, with a few cases in northern Bulgaria. However, this reported increase in Poland may also be due to the surveillance and population control activities which have been carried out in early 2019. In many parts of Eastern Europe and Russia, there has been a severe winter this year and it is likely that additional wild boar carcases will be found as the snow melts. As these will be sampled, this may result in a small surge in positive reports in certain countries. Disease in wild boar is more likely to spread during the winter months which favours virus survival in the environment, as well as the increased likelihood of wild boar scavenging on other wild boar carcases which have not decomposed in the cold weather. However, while control efforts may be reducing incidence in domestic pigs, the wild boar population represents a significant reservoir in Eastern Europe which may hinder eradication, and serve as a source for further geographic jumps. 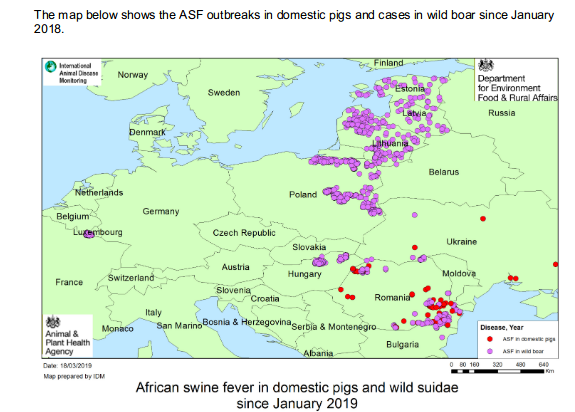 Despite the significant reduction in the number of ASF outbreaks in domestic pigs in Eastern Europe over the past six months, the disease is still present across much of the region, with large numbers of cases in wild boar. The risk therefore remains at MEDIUM for the entry of contaminated or infected products into UK, given the ongoing situation in Eastern Europe, and continued reports of ASF in wild boar in Belgium. The risk of exposure to the pig population in the UK is still highly dependent on the level of biosecurity on individual pig premises but is still considered to be low, although the situation is being kept under review. Under winter conditions, itis more difficult to effectively disinfect vehicles and equipment, and, the ASF virus persists at low temperatures for many weeks. We will continue to monitor the situation as we move into Spring. We would like to highlight to all pig keepers and the public the importance of ensuring pigs are not fed catering waste, kitchen scraps or pork products, thereby observing the swill feeding ban. All pig keepers should be aware that visitors to their premises should not have had recent contact with pigs and pig premises in the affected regions. Anybody returning from any ASF-affected area should avoid contact with domestic pigs, whether commercial holdings or smallholdings, areas with feral pigs or wild boar, until they are confident they have no contaminated clothing, footwear or equipment. Pig keepers and veterinarians should remind themselves of the clinical signs for ASF.